Last week we took a look at some of the causes of leaky gut and what happens when our digestive system is compromised. Today we’re going to take a look at what we can do to help heal the integrity of our small intestine and prevent or reverse the development of leaky gut syndrome. Drink 1-2 cups of bone broth every day. Check out my post for the full list of sweet benefits and a quick and easy recipe. Take a one-month course of probiotics every season to help rebalance your good and bad bacteria. Read these posts for more information: Part 1, Part 2, Part 3. Eat or drink fermented foods daily. Avoid or eliminate gut-irritating foods such as grains, dairy, beans, and legumes. Figure out if you’re allergic to certain foods and eliminate them from your diet. Try an elimination diet protocol. Contact me if you want guidance! Drink herbal teas such as pau d’arco (anti-parasitic), mint, ginger, lemon, or marshmallow to help improve digestion, rebalance and heal your tummy and digestive tract. Get testing done to see if you may have parasites or a candida overgrowth as both will damage the digestive tract continuously regardless of what else you’re doing. Take L-glutamine—this amino acid is used as fuel by the cells of your intestinal tract, which helps them regenerate quicker. Try supplementing with zinc, vitamins C, D, E, and A, and fish oil. These supplements are necessary components of healthy epithelial tissue. If you want to go this route contact a certified healthcare professional familiar with supplement protocols (like me!). 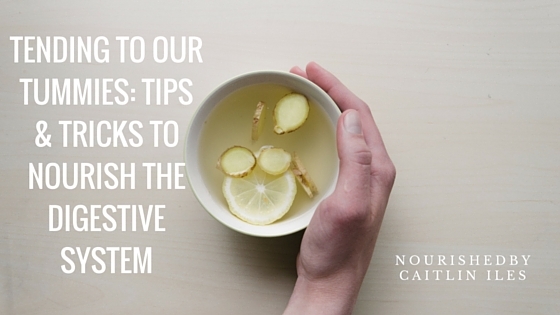 So those are some of my simple tips and tricks to help maintain the integrity of your digestive tract. Thanks for stopping by!